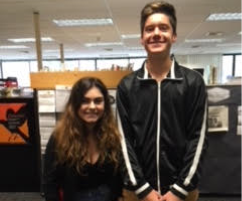 The East Side News sat down with Tina Serghany, sophomore president, and Lucas Romanowski, freshman president to gain a first-hand look at what is to come within the school year, and to gain their insights. Romanowski, who was elected two weeks ago, expressed that he is super excited to be declared the winner. He knows it’s a big responsibility and but he is ready to get to work. When asked why he wanted to run, Romanowski answered that he wanted to get involved because he was involved in middle school. Also, he knew that he had what it takes to lead as president, and that enjoys working on behalf of the class of 2021 to make the year as successful as possible. Being that this is the first administration for the class of 2021, all of the officers elected were new, and interestingly enough, they are all boys. Romanowski said that in his opinion there were definitely some underdogs who won, but he was glad that the class elected qualified and knowledgeable students to the administration. An interesting turn of events took place in the sophomore administration, and the entire freshman cabinet was reelected. Serghany mused, “If it ain’t broke, don’t fix it.” She said that she had a really positive experience with her other officers last year and she really enjoys working with them. Even though the freshman administration isn’t even a month old yet, it is already creating ideas to help the class of 2021. Romanowski said that he really wants to work on having fun events to bring the class together early, as well as short-term goals. The freshman class will be taking over Bagel Wednesday, which we will see start shortly. The class of 2020 has a host of fundraisers set up like splitting profits with Panera, Chipotle, and Andersons, as well as Barnes and Noble. They will be bringing back Muffin Mondays from last year. They also plan to sell class apparel as a form of fundraising. In addition to their plans for the class, we asked them to tell us five things that their constituents might not know about them. Romanowski stated that he loves playing soccer, and was a member of the JV Soccer Team at East. He is an active volunteer in the community, and particularly enjoys helping out at The Summit Center, a school for children who are mentally disabled, at their annual walkathon. He spends his winter snowboarding at Holimont Ski Area. He has played piano since kindergarten and doesn’t have cable TV. Serghany said that she enjoys cooking and baking, as well as spending her free time playing piano, which she has played since fourth grade. She can speak three languages, English, Arabic, and Armenian. Her Harry Potter house is a Slytherin (determined by taking an online quiz), which is characterized by being ambitious, cunning and resourceful, all good qualities of a president. She also said that she is very good at whistling. If you want to become involved with either class, do not hesitate to contact any member of your administration. As they begin to fundraise for JDD and prom, both presidents seemed determined to have a great and prosperous year.